I swear every house I visited while growing up in the late ‘70s, early ‘80s had a wooden Labyrinth Marble Maze game. Thanks to the LEGO Ideas program and creator JK Brickworks, it’ll be making a comeback later this year. Rather than moving the marble through the maze, the classic Labyrinth Marble Maze features a pair of knobs that tilt the entire game board up and down, left and right, guiding its spherical passenger along twisting corridors. 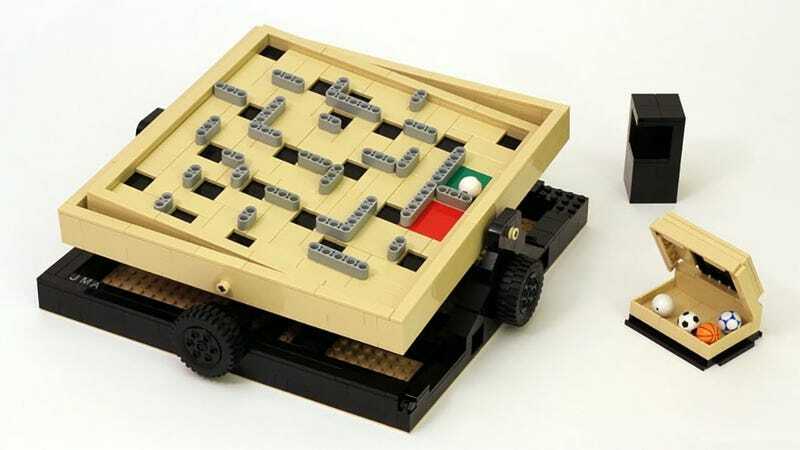 JK Brickworks’ version, which achieved 10,000 supporters on the LEGO Ideas website and just beat out projects like a 30th anniversary Goonies pirate ship in the competition to become an official LEGO product, allowed players to change up the corridors in the mazes using the power of pegs and plastic. That’s not the final version LEGO will be releasing, but I can’t see the company improving much on JK’s design. It’s just perfect. As for the other projects in this latest round of evaluation, they’re all dead now, save for one. Nosmigon’s F7A Hornet, a model based on the upcoming space sim/first-person shooter/whatever else Star Citizen is still under consideration by the board, which in my experience means they’re still ironing out licensing. Expect a final word on this project in the coming months. Check out the video for the third LEGO Ideas approval round of 2014 below for a peek at the sets being considered for the next official sets, including projects from Frozen, Golden Girls and The Legend of Zelda.